The Vignaioli di Radda association was founded this year and can be said to put emphasis on collaboration, passion, and tradition. 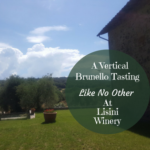 Together with a group of fellow wine writers we were picked up in Florence on a sunny Friday afternoon at the end of May, with destination Radda in Chianti. 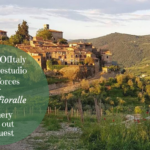 It was on May 26, and the event we were attending was the inaugural event of the Vignaioli di Radda association at the House of Chianti Classico in Radda. Vignaioli di Radda is a sub-association to the Chianti Classico Consortium that was founded earlier this year. The idea is to make it into a yearly event as a way for the winemakers of Radda to throw the spotlight on winemaking in the Radda area. 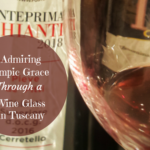 This month, October 2017, the wine and food writers in the Italian Food, Wine, and Travel (#ItalianFWT) group will focus on the theme Chianti Extravaganza. 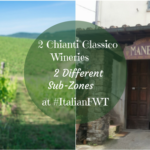 Both Chianti and Chianti Classico wines are included. 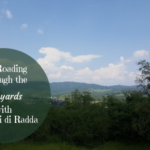 Therefore, I thought it was perfect to write about the Vignaioli di Radda as Radda is a sub-zone within the Chianti Classico that is very interesting. 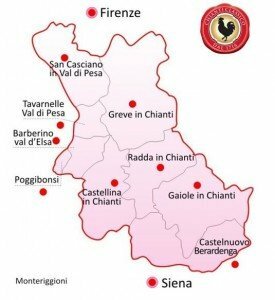 Radda in Chianti is tucked in between Greve in Chianti, Gaiole in Chianti, and Castellina in Chianti. 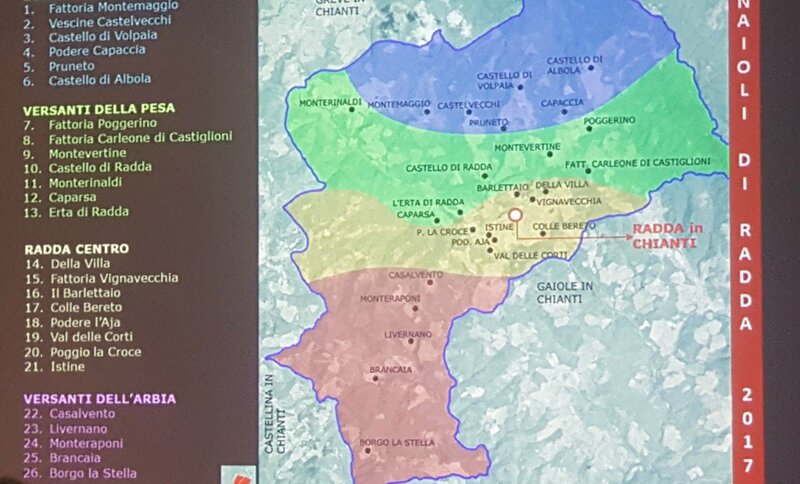 These are all four central Chianti (now Chianti Classico) locations going back to the days of the Lega del Chianti in the Middle Ages. Radda dates back to about 2000 BC as an inhabited area and by the fall of the Roman empire in the V century, small hamlets such as Monterinaldi and Volpaia had already been formed. Radda was the administrative center of the Lega del Chianti which was a political and military alliance created by the Republic of Florence in the Middle Ages. Radda has, furthermore, always been a rural center and still today the main focus is on agriculture and, especially, on viticulture. The areal of vineyards in the Radda district is about 700 ha (1700 acres). Radda è un “cucuzzolo di alberese, duro come la testa dei raddesi“ (Radda is a top of limestone that is as hard as the heads of the Radda people). He made this statement at a talk about zoning organized by Davide Bonucci from Enoclub Siena a couple of years ago. See Chianti Classico come la Borgogna, scopriamo i village de noantri by Andrea Gori in Intravino. Winemaking in Radda has evolved during the last decades. 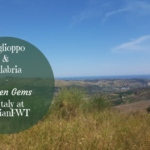 When I visited Roberto Bianchi at Val delle Corti winery a couple of years ago, he told us that it up until the 1980s was hard to make good quality wine in Radda. This was due to the very rough soil and the need for long maturation periods. The climate change now favors altitude and has made winemaking easier in Radda. This has resulted in the production of high-quality Chianti Classico wines. See my article Val delle Corti – A Love at First Sight. On Saturday, October 7, you can join us on Twitter at 11amEDT / 17.00 CEST to learn more about Chianti and Chianti Classico wines. Just type in the hashtag #ItalianFWT in the search field and click Enter, thereafter, you click Latest which will show you all the live tweets. The Vignaioli di Radda event was introduced by Roberto Bianchi, the owner of Val delle Corti winery that I talked about above, who has been one of the main initiators to this association. This was followed by Pier Paolo Mugnaini, the mayor of Radda, and Giuseppe Liberatore, the director of Consorzio Chianti Classico, who presented the association and this day in Radda. As you can notice, the Chianti Classico Consortium has had a key role of support in the founding of the Vignaioli di Radda”. After the introductions, the agronomist Andrea Frassineti held a short presentation where he talked about the history of the Radda territory and the type of viticulture and winemaking applied in the area. Then the wine tasting kicked off with a specific focus on a horizontal tasting of the 2013 vintage. Every producer also had a stand in the cloister where you could taste a selection of Chianti Classico vintages that they had brought for the occasion. The party went on with a buffet dinner and a local rock band entertaining. Later on, we all jumped in to dance and have fun together. Chianti Classico is growing stronger as a consortium and a brand for every year. The visibility internationally is increasing so it seems to be the right time to seize the moment and form a winemakers’ association. The winemakers in Radda can hopefully in that way draw the attention to their work as a sub-entity within the consortium. The concept of zoning and the founding of sub-associations within the consortium is nothing new though. The Unione Viticoltori Panzano that was founded in 1995 was probably first out with this idea. They were also the first organic district of winemaking in Italy. 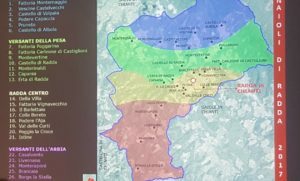 After that, other sub-associations in the Chianti Classico area have followed, such as Viticoltori di Castellina in Chianti, Associazione Viticoltori di Montefioralle, Classico Berardenga Viticoltori di Castelnuovo, etc. The Vignaioli di Radda do not explicitly talk about zoning though. They put a stronger emphasis on the importance of the common viticultural heritage and the land’s natural inclination for viticulture and winemaking. While attending the event, listening to the presentation by Andrea Frassineti, and reading the different articles about the new association, I came to think of three common denominators. More precisely, Collaboration, Passion, and Tradition. In total, there are about 30 wineries in Radda of which 27 are part of the Vignaioli di Radda association. Out of these 27 wineries, 26 were present at the event with their wines. Another interesting fact is that 21 of the wineries mentioned above are organic in their farming approach. They have all worked together to create this association in an area where viticulture and winemaking are central. The larger wineries, as well as the small wineries with just a few acres (ha), have united to communicate the essence of the Radda territory. The collaboration goes beyond the Chianti Classico denomination with Montevertine winery being part of the association. Passion is, in general, an important part of a winemaker’s daily efforts. The Vignaioli di Radda have a true passion for the rough and sometimes difficult territory on a high altitude. A harsh territory that however gives fresh, mineral, and elegant wines. Their love and passion for what they do and for the long tradition that they are passing on shine through in their eyes. This is probably the common denominator that should have been mentioned first. History and tradition are indeed very important concepts when defining the Radda territory and its winemakers. They are all given the opportunity to have access to and share a common agricultural and viticultural heritage. Generation after generation has farmed the very particular and rough Radda soil throughout the years. The Vignaioli di Radda is valorizing this heritage in this new association. This article has been more about the idea behind the Vignaioli di Radda association. Of course, we tasted a lot of wines at the event in Radda but there is not enough space to discuss them all here. Furthermore, I think it would not be fair to single out any producer and talk more in detail about their wines. The past and present shapes the future. The past has had a strong influence on and importance for the viticulture and winemaking in the Radda area. In May, this resulted in the founding of the Vignaioli di Radda association. Will this present step shape the future of winemaking in Radda? Well, that is surely the aim of this initiative. Collaboration, passion, and a focus on the common heritage will surely lead to the production of wines with a stronger identity. An identity which can help to communicate the common traits of Radda wines within the consortium and beyond. I didn’t realize all these sub-associations existed. Interesting to know that winemaking was tough there til the 80’s. I love Radda. Stopped in for some pizza there my last visit. Agree Jen, Radda is a great place. There are sub-associations in almost all the sub-districts now, these last ones have gained more attention also communicating more about themselves. 21 of the 30 wineries in Radda are organic! 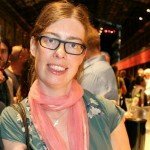 This alone could be something interesting to dig into, and could possibly be a great way to further strengthen the Radda Winemakers Association and visibility with the rest of the world. A lot of organic wineries, true, and good for the Radda winemakers to profile themselves. Though the true branding as an organic association has already been done by the Panzano association where all members are organic. 🙂 However, it is still good for these associations to show themselves organic for the broader world. Fascinating how climate change is favoring Radda winemaking. We will se if other regions of Europe also benefit. Unfortunately with climate change we are also seeing radical weather events. Love that so many the wineries are organic! Yay! It’s so interesting to better get to know one of the Classico sub-zones. The trip sounds like it was absolutely lovely too. 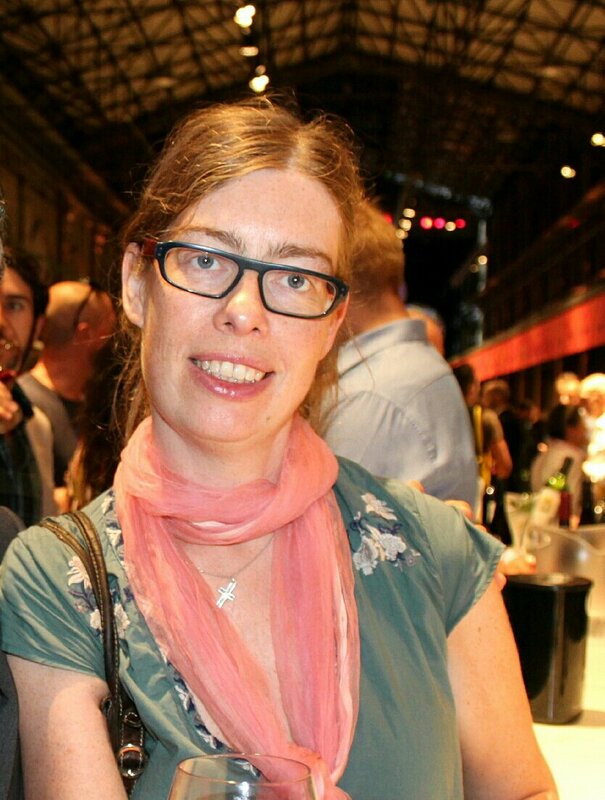 Thanks Nicole, yes, the Radda association of winemakers did a great job.